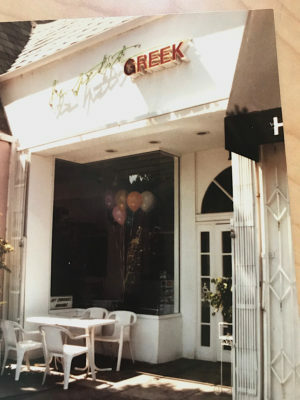 LE PETIT GREEK as it looked before its expansion in 1997. Thirty years ago, May 25, Thomas Houndalas opened the doors at 127 N. Larchmont Blvd. as Le Petit Greek Estiatorio. A year and a half later, brother Dimitris joined him in the new venture that would become one of Larchmont Village’s most venerable establishments. But when it comes to the Houndalas family history as restaurateurs and hospitality, 30 years is just a drop in the proverbial bucket. Though no fuss was made last month for the anniversary, Nora Houndalas, wife of Dimitris, said that their goal that day was to “prepare great food” and to “serve our customers with care, to respect our employees, and to quietly nod to each other ‘well done.’” And maybe enjoy some baked sweets. That sounds like a well-deserved celebration for anyone 30 and over, especially in a family that has held the tradition of food and hospitality in its heart for more than a century. Nora said that they have stayed in business this long because they have learned that “in life, as well as business, one must learn to be adaptable,” while remaining true to oneself. Besides adapting to changes in the economy, regulations and laws, there also are changes in consumer interests in food and how and what guests choose to eat. NEW YEAR’S Day, Dimitris Houndalas toasts the year 2000 in front of Le Petit Greek. Le Petit Greek has gone through changes over the years. The restaurant began with 10 tables in 1988, and it expanded to include an outdoor patio in 1997. There was also the writers’ strike in 2007, and after that the recession. And of course now, many people take advantage of delivery services, ordering their food to go instead of dining in. And the work is not easy. Many sacrifices have been made along the way, said Nora, including losing sleep and missing out on family time. However, the goal of creating and serving good food remains the same, she maintained. Nora also noted that Hellenic cuisine is healthy, which is especially important to Dimitris, who writes the blog on the restaurant’s website. He focuses on keeping the food health conscious as well as delicious. One additional change is that Thomas Houndalas has stepped back from the restaurant in Los Angeles to run a bed and breakfast, also named Le Petit Greek, in Santorini, Greece. There is some speculation that others in the family immigrated to the U.S. as early as 1850. What is known is that the three brothers — Mihalis (Michael), Thomas and Louis — opened a small restaurant in San Francisco called The Cliff Café, which Michael continued to run for many years. CLIFF CAFÉ in San Francisco. 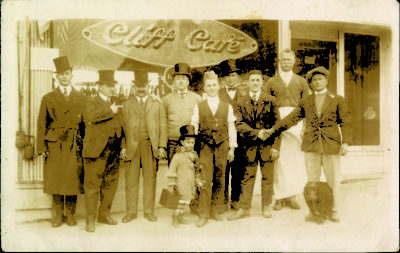 Thomas Houndalas, grandfather to Thomas and Dimitris Houndalas of Le Petit Greek, is third from the left, circa 1910. After several years, Thomas, the grandfather of current Le Petit Greek owners Thomas and Dimitris, went back to Greece to find a wife. While he was there, however, World War I broke out, and he stayed in Greece to help his family through the war while his brothers remained in San Francisco. Dan, grandson of one of the brothers (Michael) who remained in the U.S., and his wife, Mary Hountalas, have owned and operated San Francisco’s historic Cliff House since 1973. Cousin Tom Hontalas runs the nearby Louis Café, founded in 1936 by his grandfather, Louis, also one of the original three brothers. Cousin Chris Hontalas (a grandson of Michael) operates Venice Gourmet Delicatessen in Sausalito, which has been open since 1969. So, yeah, 30 years is a walk in the park for this family. Meanwhile, back in Greece during and after World War I, Thomas Houndalas and his wife Evthokia had a large family (eight kids). According to family historian Mary Hountalas, while Thomas had “had a lot of money” when he returned from the U.S., he spent nearly all of it to support his family in Greece, and remained very poor. “It is true that Thomas had the best soul of all the Hountalases. He had goodness in his blood. Even though he was poor, you would never see him worried,” she writes. 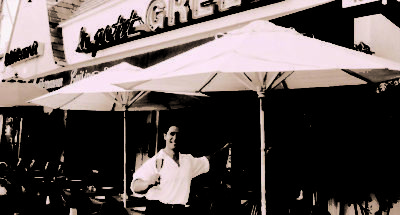 According to Nora Houndalas, one of Thomas’ sons, Gregorios, was a chef who ran some of the most popular restaurants in Nafplion, Greece. Gregorio’s son, Thomas, moved to London before eventually landing in the U.S. in 1982. 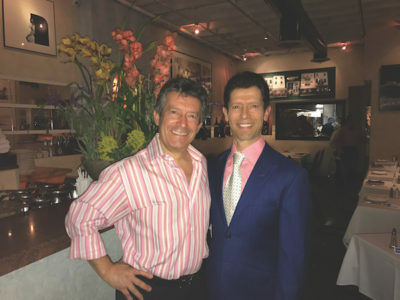 In Los Angeles, Thomas was maître d’hôtel at downtown’s Jonathan Club for a time, before opening Le Petit Greek on Larchmont. It was at the club where he met Nora Sullivan, who eventually married his brother Dimitris. Nora said that, before Gregorios passed away, when he would visit his sons in Los Angeles, he would make specials for Larchmont customers. Just part of the long family tradition. THOMAS AND DIMITRIS Houndalas, 2017. What does the future hold for Le Petit Greek? According to Nora, they hope to have a cookbook out within the next couple of years, and it will include some of the most humorous anecdotes from the restaurant, as well as share family recipes. “We’d also like to be a cultural landmark and be here to celebrate our 50th anniversary,” she added.